Soapstone gets its name from its greasy, soapy feel. As a talc-schist metamorphic rock, soapstone also goes by the names steatite or "soaprock." 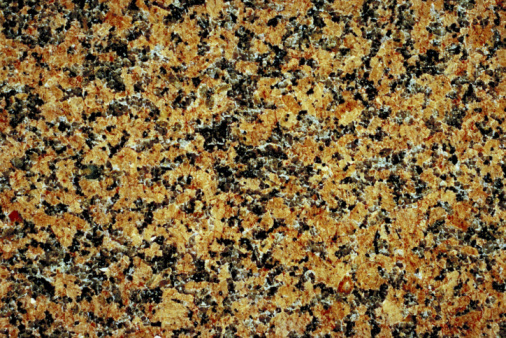 Its qualities make it durable and resistant to heat and stains, which also makes it an ideal countertop choice. Because of its high talc content, soapstone is soft and easy to carve -- making it the rock of choice for sculptures. Despite its durable properties, hairline cracks or small nicks can develop. You can repair minor blemishes yourself, but if the crack or damage is severe enough to compromise its structural stability, have a skilled professional make the repairs. Clean along and around the crack or damaged area with a cotton swab and rubbing alcohol. This not only cleans the area, but helps the stone accept the epoxy for a better bond. Allow the area to thoroughly dry. Mix together the epoxy resin and hardener on a paper plate with a wooden craft stick. Follow the manufacturer's recommended resin-to-hardener ratio, as this can vary by brand. Mix in a small amount of the matching stone coloring pigment. If you can't find a perfect color match, use a pigment as close to the stone's color as possible. Take a thin-blade putty knife and scoop a small portion of the mixture from the plate onto the edge of the knife. Hold it on a 45-degree angle and drag its edge back and forth across the surface to work the epoxy into the crack or damaged area. If you're working on an object that doesn't have a flat surface, use an artist's paintbrush to apply the epoxy. Mound the epoxy slightly above the stone's surface and blemished area. Work quickly because the epoxy starts to harden after a few short minutes. Reload your knife or brush as needed and repeat until the entire crack or damaged area has been filled. Follow the manufacturer's curing-time guidelines, which can range from 24 hours to several days, before sanding. Wrap 120-grit sandpaper around a sanding block to sand the hardened material over a flat surface. For surfaces that aren't flat, fold the sandpaper into a manageable size. Gently sand the repaired crack or damaged area to knock the small epoxy mounds down, to where they are flush with the surrounding surface. Repeat with finer 180-grit, followed by 220-grit sandpaper. Wipe the area with a damp, clean rag to remove the dust created by the sanding process. Pour a small amount of mineral oil on a clean rag and buff the repaired area. Wait 24 hours and buff again with the mineral oil.